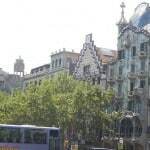 If you’re visiting Barcelona and really want to experience the magic of the Catalan capital, you should definitely get in touch with Simon Harris. Simon has lived in Barcelona since 1988, has had a career as a local rock star, taught English at many of the top language schools, been Professor of English at the Universitat Autònoma de Barcelona, and translated various books from Catalan and Spanish into English and vice versa. If anyone really knows about Barcelona and Catalan culture, it’s Simon Harris. Following the success of his acclaimed “Going Native in Catalonia”, Simon is currently working on a new book about Barcelona and in the course of his research has rediscovered one of the reasons why he fell in love with the city in the first place – Modernist Architecture. 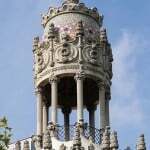 For a modest €25 per person, Simon is currently giving four Guided Tours of Modernist Barcelona. • La Manzana de la Discordia and Casa Batlló shows you three major buildings on the Manzana de la Discordia – the Block of Discord – where the three most influential Modernist architects have important buildings – Casa Batlló by Gaudí, Casa Lleó Morera by Domènech i Montaner and Casa Amatller by Puig i Cadafalch. These buildings exemplified the rivalries and difference between the architects at the time, but with hindsight what you see are the similarities. 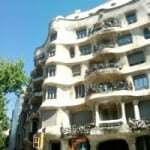 • La Pedrera and Passeig de Gràcia takes you from Plaça de Catalunya up Passeig de Gràcia – the Eixample’s most emblematic street stopping to look at Modernist paving stones and benches and streetlamps by Gaudí. If you know where to look, there are some incredible doorways. The tours finishes with a trip round Gaudí’s magnifiecent Casa Milà, which includes a quick look at the pottery exhibition by Artigas in collaboration with Joan Miró. 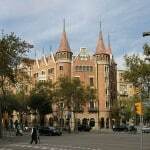 • From Sagrada Familia to Hospital Sant Pau is a walk along Avinguda Gaudí between Barcelona’s two most important Modernist buildings in the company of someone who knows every nook and cranny of the city. The trip begins with a walk round Domènech i Montaner’s hospital, which was built in the beleif that beauty would cure the soul and therefore cure the body, and finishes at Antoni Gaudí’s breathtaking Temple Expiatori de la Sagrada Famila – Expiatory Temple of the Sacred Family – built to atone for the sins of an increasingly irreligious and anarchistic Barcelona. Simon is also happy to be hired by very small groups at a cost of €250 for the day. ‘Obviously there are places where I know the owners and can take a group of two or three people, but 10 or more is really out of the question,’ comments Simon. 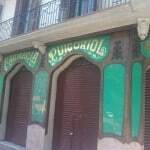 The tours begin at 10.30 in the morning and finish at 1.30, whereupon all those inclined can adjourn for a slap up three-course lunch in a restaurant frequented only by Catalans – and Simon, of course. This is a great chance to learn about Catalan food on the cheap – another of Simon’s passions. 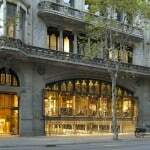 You can book your Modernist Guide Tour here and read about Barcelona’s Modernist architects and buildings on the Barcelona Language Learning site.